As well as Condo’s ethics in working for the Bush Administration. While I don’t believe there is any evidence that GW is a bigot, there is more than a little evidence that some of the folks he brought to Washington were and are. The nuances of whether she could have done more not taking the job, or accomplished more by taking the job are also open to debate. Calling Condo a latter day Hattie McDaniels is unfair. Calling her a failure because of her role in a failed Presidency..isn’t. I think this reaction is because of he Trayvon Martin murder. Like the George Zimmerman trial, initial efforts to convict the murderers were stymied, with the first conviction not coming for another 14 years, with others not being convicted until 30 years later. Justice in some parts of America moves much more slowly for some people. 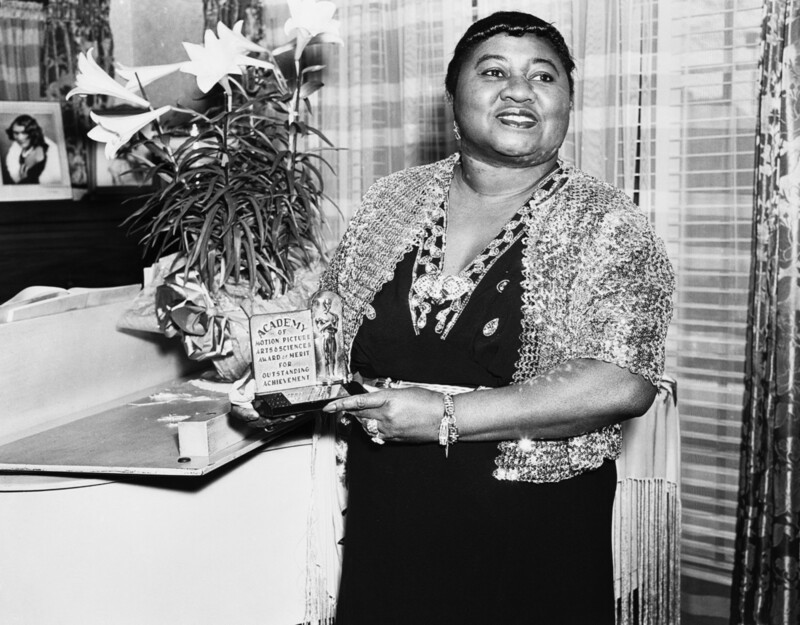 American actress Hattie McDaniel (1895 – 1952) with her Academy Award of Merit for Outstanding Achievement, circa 1945. McDaniel won an Oscar for Best Supporting Actress for her role of Mammy in ‘Gone With The Wind’, making her the first African-American to win an Academy Award. When a church bombing killed four young black girls on a quiet Sunday morning in 1963, life for a young Condoleezza Rice changed forever. The racial attack on the 16th Street Baptist Church, in the former secretary of state’s hometown of Birmingham, Alabama, rocked the nation and led to sweeping changes in laws governing civil rights. But for Rice, just 8 years old at the time, the tragedy meant the death of a little girl she used to play dolls with, and the loss of her own youthful sense of security. “As an 8-year-old, you don’t think about terror of this kind,” said Rice, who recounted on Friday her memory of the bombing and its aftermath in remarks to a gathering of civic leaders in Birmingham as part of several days of events leading up to the 50th anniversary of the bombing on Sept. 15. Rice’s hometown had become a place too dangerous for black children to leave their own neighborhoods, or go downtown and visit Santa Claus, or go out of the house after dark. “There was no sanctuary. There was no place really safe,” she said. Rice’s friend, 11-year-old Denise McNair, died in the blast along with 14-year-olds Carole Robertson, Addie Mae Collins and Cynthia Wesley. Their deaths at the hands of Ku Klux Klan members garnered national support for passage of the Civil Rights Act of 1964. Events for the 50th anniversary of the bombing will include a screening of filmmaker Spike Lee’s new documentary, “Four Little Girls,” and a memorial service on Sunday scheduled to include U.S. Attorney General Eric Holder. Rice has a treasured photo of her friend accepting a kindergarten certificate from Rice’s father, who was a pastor at another church. McNair had gone to preschool there. McNair’s father was the community photographer, documenting birthday parties and weddings in happier times. “Everyone in the black community knew one of those girls,” Rice said. Her father told her the bombing had been done by “hateful men,” she said, but it was an act that later uncovered something ultimately good. “Out of great tragedy, people began to recognize our humanity, and it brought people together,” said Rice. The bombing left its mark on her even as an adult, when as U.S. Secretary of State under President George W. Bush, she used the experience to understand the plight of Palestinian and Israeli victims of bombs and attacks during peace negotiations. But with all of the progress made in civil rights during the 50 years since the blast, Rice cites education as the biggest impediment to equality in modern times. She expressed dismay at racial disparities in the quality of education for minorities and criticized the “soft bigotry of low expectations” in a system she said challenges black students less than others. 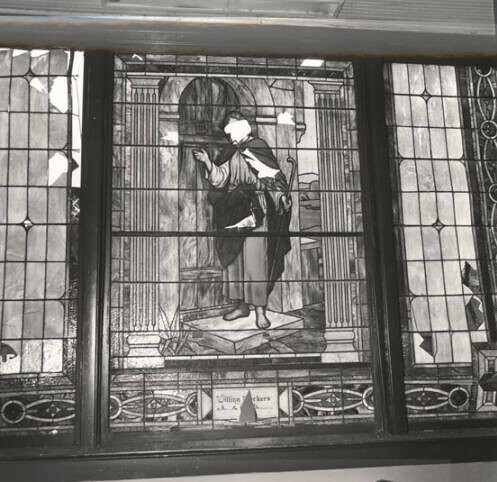 A Stained Glass window in the 16th Street Baptist Church after the bombing. Enjoy everyone, dinner with family and friends wherever you are! That’s right, the Queen of Soul and Condolezza Rice will be performing at a charity. Condi, among her many achievements, is a talented classical pianist – and everybody knows Aretha can sing. Call ’em bipartisan soul sisters. Democrat Aretha Franklin, the Queen of Soul, is tapping her Republican pal, former Secretary of State Condoleezza Rice, for a concert in Philadelphia next month. The odd-couple pairing is more likely than it sounds, since Rice is a classically trained pianist and Franklin is currently working on an opera record featuring well-known arias. “Ms. Rice is a consummate classical pianist and since I sing the arias, I thought that we could do something — a bipartisan effort for our favorite charities,” Franklin said. At the show, set for July 27 at the Mann Center for Performing Arts, Franklin will perform a program of Handel, Mozart and her own hits. Rice will also perform a 20-minute set with the Philadelphia Orchestra. She has previously appeared on a bill performing with master cellist Yo-Yo Ma at the 2002 National Medal of Arts awards ceremony. A rep for Franklin said it’s expected that she and Rice will also appear at the Kennedy Center in Washington, DC, and at Carnegie Hall in New York. Condo’s net worth while working for the Bushit was estimated between $1.3 million and $2.9 million making here the 20th wealthiest government executive at the time. This is good money, but it damn sure isn’t F”k You money in today’s screwed up economy. Her earnings potential going forward is significant, but somewhat constrained by the political climate. She is assured a significant income from Hoover Institute providing racial cover to the scientific racism generated by the other “fellows”. Which raises the question of why “buy” two memberships in Golf Clubs which she isn’t going to visit more than 1 or two times a year (at best). Undoubtedly, the Golf Clubs in question are paying Condo to be their “black member”, much the same way Hoover pays she, Tommie Sowell, and Shelby Steele as racial cover. In for a dime, in for a dollar… Indeed. BIRMINGHAM, Ala. (AP) — Former Secretary of State Condoleezza Rice has joined two exclusive golf clubs in Alabama.